Flanged ball valves are convenient because they are simple to add or remove. They are manufactured in a wide range of standard sizes, making it easy to retrofit an existing pipe line with a ball valve. Flanged ball valves can have a diameter of less than an inch or more than a foot. They are opened and closed by a lever, handle or hand wheel and usually require only a quarter turn before instantly shutting off. Flanged ball valves are made from metals such as stainless steel or brass, making them durable and long-lasting; they retain their function even if they are not used for years. Though generally not used in throttling applications because of the small range of motion of the actuator, incremental opening and closing of the valve is possible. 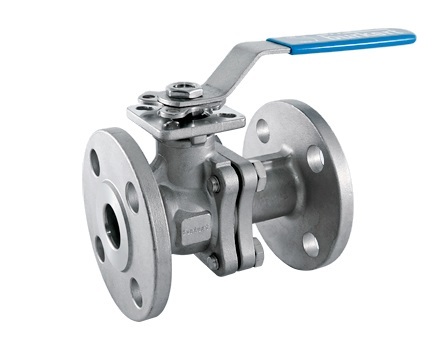 Flanged ball valves are widely used by industries that transport water or other liquids through pipes at low to high pressures and temperatures. Flanged ball valves provide the ability to start and stop the flow of liquids and to change pipes without disrupting the entire line. Flanged ball valves are only different than other ball valves on the exterior. 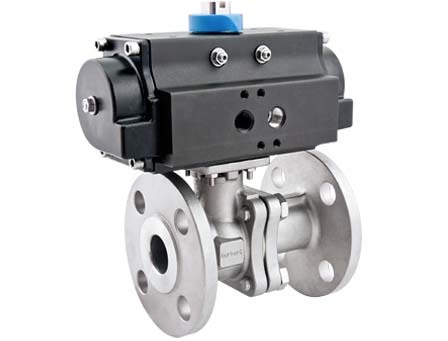 Besides the flanges, these valves consist of a ball with at least two holes or ports. The most basic ball valve has one inlet and one outlet with a straight hole bored through the ball. When rotated 90° the hole moves perpendicular to the passageway and blocks the flow. L type ball valves have two short bored holes that meet in the middle at a right angle. The ball can be rotated a quarter turn and connect the inlet to the outlet or when rotated a quarter turn in the other direction, will connect to a second outlet. T type flanged ball valves have three holes that meet in the center to form a T shape. The current can flow into both outlets simultaneously or to one or the other. The ball can vary in size; full port ball valves have a ball that is larger than the size of the passage and the hole is the same diameter of the pipe. There is no flow restriction for valves of this kind because the pipe walls are flush with the hole, resulting in zero wear. Reduced port balls are the opposite because they use small balls with even smaller holes to cause a large flow restriction. Flanged Ball Valves Flanged ball valves are mechanisms that use an inner rotating ball to shut-off a pipe line. The outside edges of the enclosure are raised into a flange and have holes appropriately placed for bolting the valve in between pipes. Other ball valves have internal or external threading that allows the valve to be screwed into a piping system.